Every summer, people come from all over to visit Vermont State Parks. Return visitors are loyal to their favorite campsites and swimming spots and choose to come back year after year because of their connection to the park. Every park is different and offers an abundance of fun outdoor activities. Last winter, after receiving Vermont State Park passes as gifts, Vermont couple Anne and Steve set a goal to visit every Vermont State Park within the year. There are 52 state parks in Vermont, spanning the length of the state, and visiting all of the parks would mean seeing many during the summer months as well as during the off season, which begins in October. 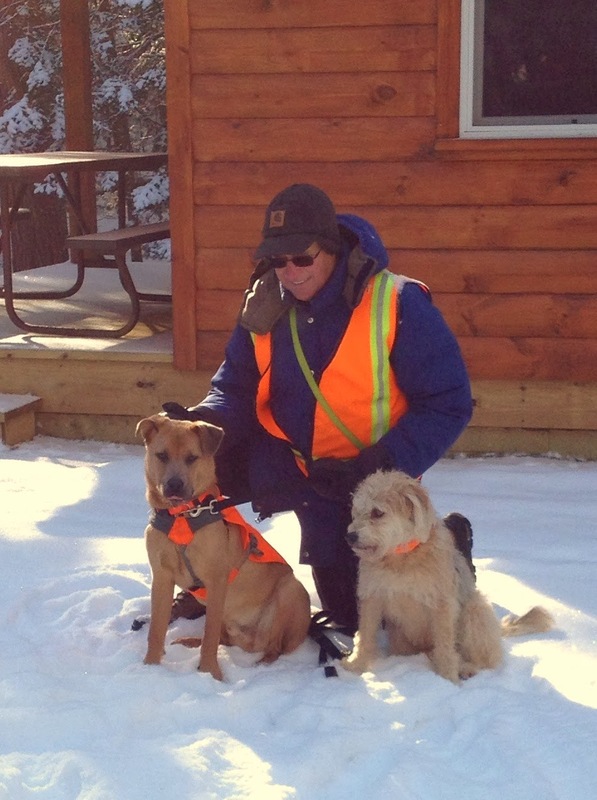 The couple began the challenge in mid-January 2013 with some cross-country skiing at Little River State Park in Waterbury. We asked Steve and Anne to give us some insight as to why they decided to embark on the state park challenge, how they did it, and to describe some of their favorite experiences in the parks. Although the regular camping currently remains in-limbo until next season, it doesn’t mean that parks remain vacant and unused. It is not until one lives within the park boundaries in the off-season that one sees just how vibrant a park can be, even when it is closed. Despite a quiet fall, since the hunting season has ended and the snow has made its way to the ground, visitors have been coming in daily to take advantage of our park (Brighton), in particular, though I am sure it is similar at other state parks. People come in by foot, by snowshoe, by skis, etc, just to take advantage of all this wonderful place has to offer. The local communities hold onto and care for the state parks like they are a part of their own lives and heritage. The roads are groomed through community support for recreational enthusiasts and daily park users hang Christmas ornaments on trees along park roads and trails. The adaptive short-tailed weasel/ermine is a remarkable winter animal. In periods of warmer weather, the weasel’s fur ranges from brownish-red to black, with white fur on their belly. As winter approaches, and daylight decreases, the weasel’s fur turns to white and serves as a type of camouflage in the snow. During this period, the weasel is known as the ermine, which means “white winter color” in French. The small but ferocious weasel is a skilled hunter. They are carnivores who eat primarily shrews, voles, cottontail rabbits, and rats. 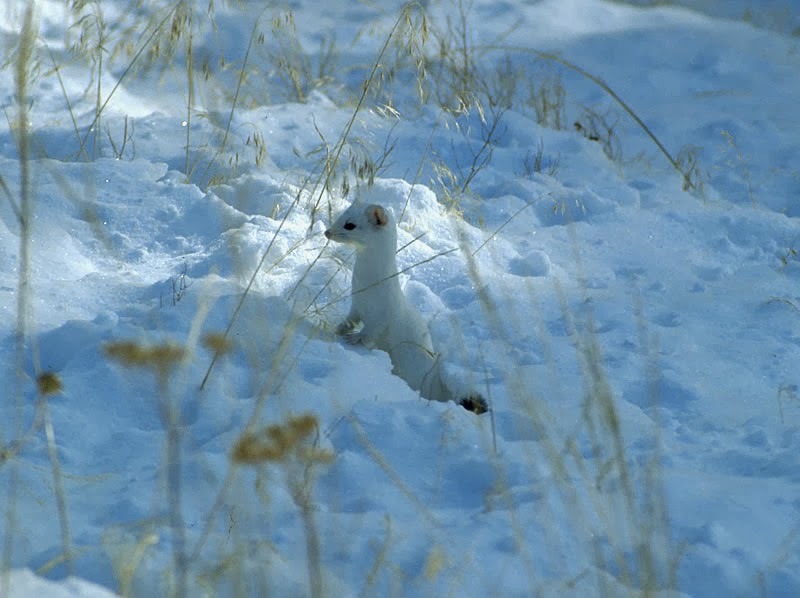 In the winter, the nocturnal weasel/ermine hunts beneath the snow where their prey may have burrowed to keep warm. They are known to store extra food or eat animals that are easier to catch like insects or birds if hunting is unsuccessful or food supplies are low. The beaver is one of Vermont’s busiest animals, so it’s not surprising that they don’t hibernate during the winter. 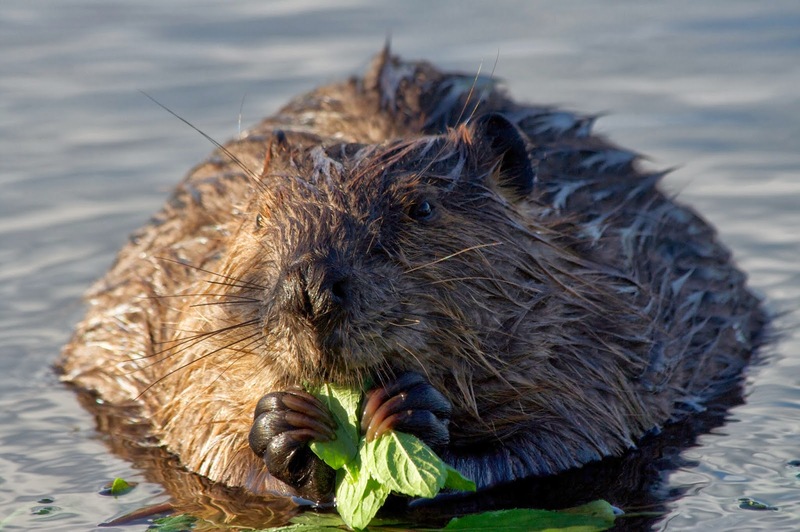 The beaver is well-adapted to survive in water, with webbed toes on their hind feet and a tail that acts as both a rudder and a way to control their body temperature. Like the snowshoe hare, their young, called “kits”, are born fully furred and begin venturing outside on their own at about two weeks old. During the fall, beavers begin preparing for winter by cutting trees and constructing their dams and lodges. In the winter, beavers eat a woody diet of bark from trees like poplar, alder, willow, and cherry. They construct their lodges from mud, stones, sticks, and branches and store their food supply in a large underwater pile within the lodge. It takes one ton of bark to feed a family of eight beavers for a winter. Last spring during a trail walk, Neil Monteith, a forester with the Vermont Department of Forests, Parks and Recreation, discovered a large red pine tree at Brighton State Park. After measuring the height, circumference, and diameter of the tree, it was revealed that the tree surpassed the current record for the largest red pine tree in Vermont. The red pine trees at Brighton State Park are estimated to be between 75-90 years old and part of a natural red pine stand. Unlike human-planted stands, natural red pine stands are relatively rare in Vermont. The area where the record red pine was tree was found is part of a natural “Red Pine Forest” area, one of only 89 in the state. The snowshoe hare, also known as the varying hare, is another animal that remains active throughout the winter. This animal’s color changes from brown to white in the winter in order to blend in with its surroundings. In the spring, the hare’s fur changes back to brown during a six-week molting period. The color change is spurred by the amount of sunlight the hare is exposed to. The snowshoe hare has large back feet which allow it to travel through deep snow. 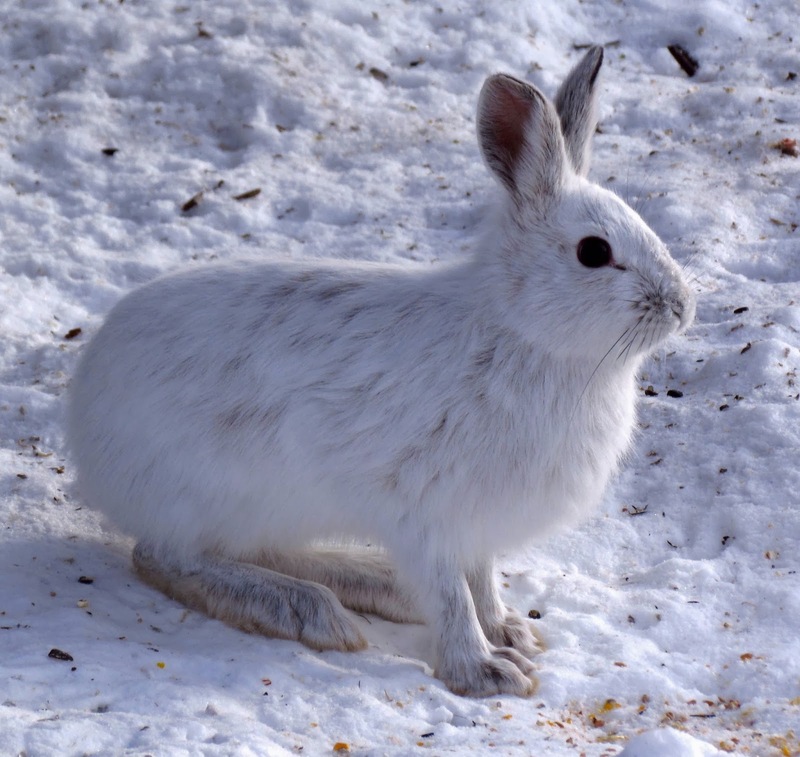 Unlike rabbits, which give birth in underground dens, the snowshoe hare gives birth above ground, and their young are born fully furred with their eyes open. These adaptations make it easier for the hare to survive harsh winter conditions. The size of their litters is connected to winter temperatures and snow accumulation, with larger litters born during periods of high snow accumulation and low temperatures. Winter is a season of rest for a lot of Vermont’s wildlife population, but not every animal goes into hibernation for the season. Like humans, many animals see the colder months as a time to seek warmth and shelter. These animals brave the Vermont winter by preparing in advance and adapting their lifestyle. 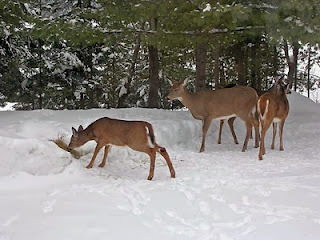 You have probably spotted deer in the woods or sprinting across the road during the winter months. Deer remain active all year long, but have to make adjustments in order to keep warm when cold weather hits. They move from fall habitats to wintering areas as the season changes. Wintering areas can range in size from a few acres to over a hundred and can be used for several generations as long as the habitat stays intact. If development occurs near their wintering habitat, deer will migrate elsewhere. Wintering areas have dense softwood cover, which protects the animal from wind and falling snow.